IDP’s “Burden of Proof” litigation campaign — aimed at ensuring that where the “record of conviction” is ambiguous as to whether a conviction is for a disqualifying offense, noncitizens are not barred from establishing eligibility for relief from removal or for other immigration benefits — has scored some big wins in recent months. Working in partnership with the Orrick law firm and the Immigrants’ Rights Clinic at Stanford Law School, we convinced three federal courts — in Sauceda v. Lynch (CA1); Le v. Lynch (CA5); and Martinez Garcia v. Lynch (CA10) — to withdraw or modify adverse decisions in light of the Supreme Court’s decisions in Moncrieffe v. Holder and Mathis v. U.S.
For more on IDP’s work on the Burden of Proof and Record of Conviction, see here. This term, the U.S. Supreme Court, in Jennings v. Rodriguez, will consider whether certain immigrants in detention for over six months are automatically entitled to a bond hearing before an immigration judge. Jennings also concerns whether certain immigrant detainees are entitled to a bond redetermination hearing every six months of detention; whether the government must bear the burden of the need for continued detention by clear and convincing evidence; and whether immigration judges at a bond hearing must consider the length of time a noncitizen has been detained. IDP, along with NYU Immigrant Rights Clinic, is filing a story brief recounting the cases of a number of immigrants subjected to prolonged detention. In September, along with IJN partners, we are publishing a three-part series of opinion pieces, each on a separate aspect of the laws. You can read the first, by Angie Junck of the Immigrant Legal Resource Center, on federal-police entanglement and the demonization of communities of color, here. IDP is working with a public radio veteran on a four-part podcast series on the history and impact of the 1996 laws. The episodes, timed to influence the immigration reform debate as a new administration takes office, will air in January. On October 22, at NYU School of Law, IDP will present a day-long CLE-accredited seminar on a variety of topics at the intersection of criminal and immigration law, in partnership with the National Immigration Project of the National Lawyers Guild, New York State Defenders Association, and NYU School of Law Immigrant Rights Clinic. The curriculum will cover Continued Litigation on the Categorical Approach; Crimes of Violence; and Particularly Serious Crimes. To learn more about the event, and to register, please click here. IDP’s Padilla Support Center recently reached a milestone: four of New York State’s regional immigration assistance centers have now signed on to contract with IDP for a year of webinar and in-person immigration trainings. Funded through an innovative state grant, the regional centers are dedicated to ensuring the promise of Padilla v. Kentucky, the 2010 Supreme Court decision that held that defense counsel have a constitutional duty to advise non-citizens about the immigration consequences of a guilty plea. In addition to providing critical support to other centers through trainings and consultations, IDP’s Padilla Support Center, which launched officially earlier this year, operates the New York City center. 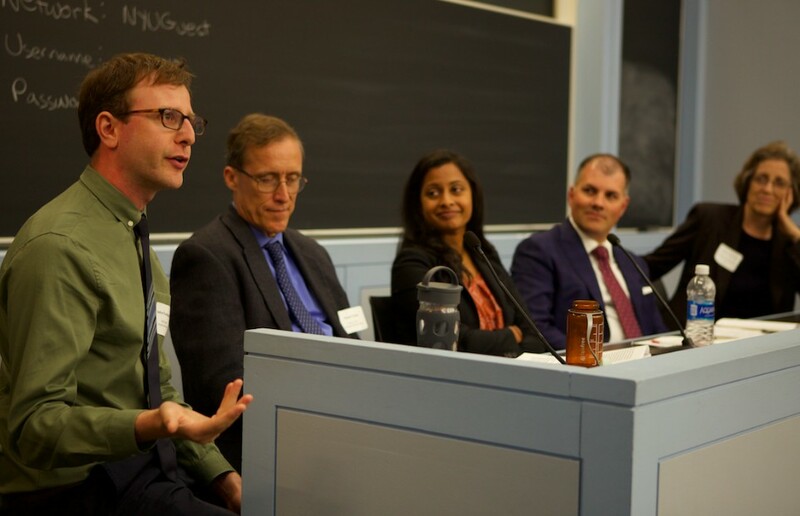 On September 15, attorneys, advocates, students, and others gathered at New York University School of Law for an evening of lively discussion of Crimmigration and the Supreme Court, in support of IDP’s litigation work. With NYU’s Nancy Morawetz moderating, a distinguished panel — Mark Fleming, a partner at Wilmer Hale and counsel in last term’s Mathis v. U.S.; NYU professor Alina Das, counsel in Lora v. Shanahan; and Manny Vargas and Andrew Wachtenheim of IDP — discussed the criminal-immigration cases from the last Supreme Court Term and those to be heard in the next.